As identity theft rates rise, privacy protection awareness is at an all-time high. As a result, we receive questions about secure information disposal every day. In this blog, we answer the most frequently-asked paper shredding questions. A: With onsite mobile shredding, a specialized shredding vehicle comes to your business and destroys your documents on premises while you watch. Offsite shredding offers the same unparalleled security with a slight difference: Your discarded documents are picked up from your business and transported in a secure, GPS-tracked vehicle to a shredding plant for destruction. The service you choose depends on your personal preference, compliance requirements, and budget. Both onsite and offsite shredding include a Certificate of Destruction for your records. Q: Why should I choose a locally-owned shredding provider? 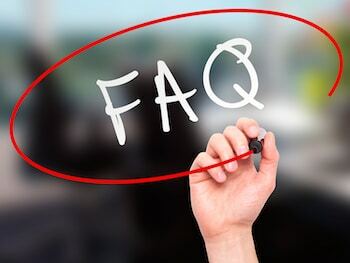 A: Unlike a national or global paper shredding company, a locally-owned paper shredding provider offers unparalleled customer care and customized service. You have a direct line of communication to an account manager who understands your unique document destruction needs. A local paper shredding provider is committed to and invested in your community. They often partner with other local businesses and organizations on initiatives and events that benefit its residents. Q: When are my documents shredded? A: With a one-time shredding service, your documents are shredded as needed. If you need your documents destroyed regularly, a scheduled shredding service gives you a routine solution. Your paper is collected and shredded weekly, bi-weekly, or monthly. Q: Am I legally required to shred? A: Yes. Several well-known federal regulations, including HIPAA, FACTA, SOX, and GLB, require businesses to securely dispose of client, financial and protected health information. Failure to destroy records in compliance with these laws can result in stiff fines and penalties. Q: Who shreds my documents? A: It’s important to choose a paper shredding company that fully vets its staff. Choose a provider who screens their employees’ employment and criminal history and requires drug testing. Individuals who handle and destroy confidential information should have extensive HIPAA compliance training. Q: What is NAID AAA Certification? Q: How does a shredding company recycle my paper? A: It depends on the shredding company. Some shredding vendors ship shredded documents overseas for recycling, which puts your information at risk. Other shredding providers have a baling operation. After shredding, your documents are baled and the paper fiber is recycled regionally. This offers a more secure, environmentally-friendly paper recycling solution. If you have a question we haven’t answered in this blog, please let us know. We promise we’ll answer it promptly!